Starting a conversation is often as easy as having live chat on your site. ConvertKit doesn’t have a live chat tool. 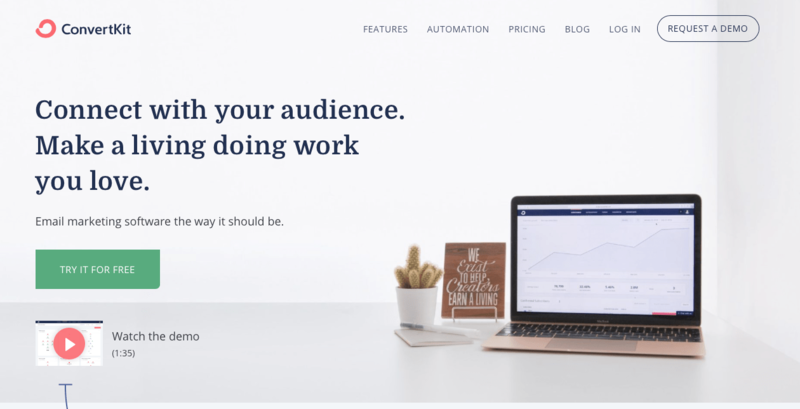 Gist offers live chat and ConvertKit doesn’t at this time. Have to give this category to Gist by default. Using our live chat tool and our backend dashboard, Gist provides a dedicated help desk solution for our users. ConvertKit’s focus is on email marketing and doesn’t offer a support product. Gist not only offers tools to aid in marketing and sales. Our help desk was created to keep the entire customer journey in one place. ConvertKit does not offer a knowledge base creation tool. Starting with our Standard plan, Gist users are able to support their customers with both a help desk and a knowledge base. With Gist’s chat bot creator, our users can create a number of bots to be there when you and/or your reps aren’t available. 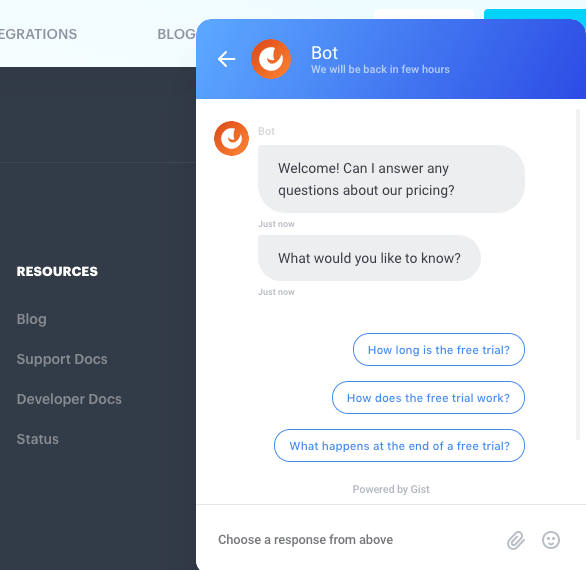 Creating bots with Gist is easy (no coding required). ConvertKit doesn’t do chat bots. 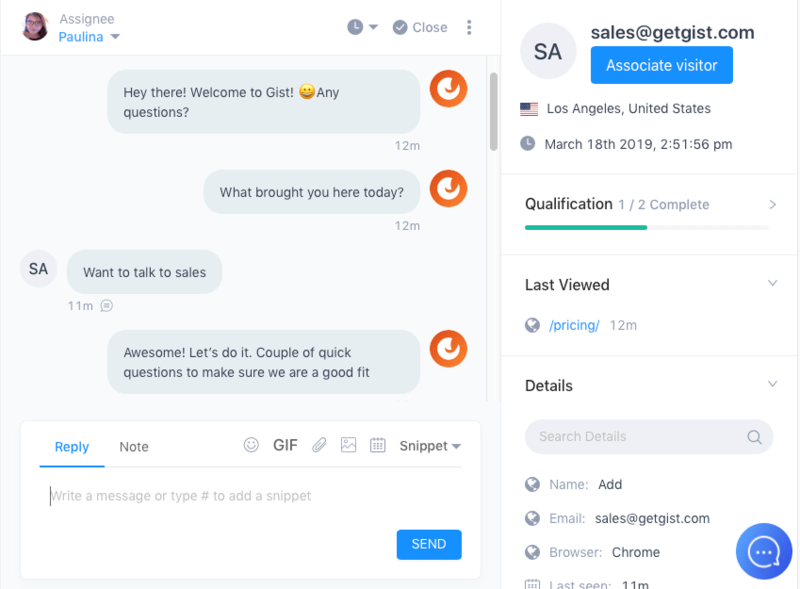 Gist’s chat bots can make your website interactive all day every day. Without a comparable tool, the win goes to Gist here. Hooking up your Google Calendar to Gist’s Meeting Scheduler tool takes a couple of clicks. You can then create a custom link, set the meeting times and title your meeting(s) (e.g. 15 minute consult call). While you can use other tools and send them those links in ConvertKit emails, there is not meeting tool available. Gist’s meetings tool ventures into the sales category, not just marketing and support. ConvertKit doesn’t have this feature and the win goes to Gist. Nathan Barry has done some really cool things. One of those things is to create a newer email marketing tool that is really, really good. 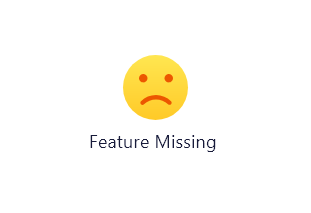 While they don’t have the same number of features as Gist — the ones they do have are super intricate and highly usable. ConvertKit offers plain text emails, just like Gist to help users avoid spam filters and really seem like a personal email. So, if you’re looking for highly visual emails neither tool offers these. ConvertKit is really good at email, especially if you’re a personal brand (blogger, author, speaker, etc.). They win the email marketing category. 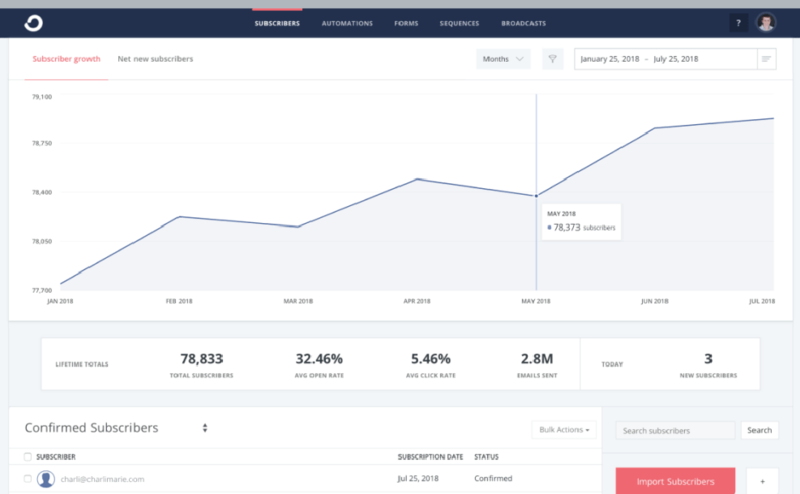 ConvertKit actually has something close to full marketing automation — more so than most others who only offer email marketing tools. That said, most of them heavily rely on integrations. Even then, they offer many of the automations that Gist does and their automation tool looks very similar to ours. Gist’s is a bit more robust in terms of how you can use it in conjunction with our other tools. Having everything “in-house” is valuable and our differentiator. ConvertKit does integrate with many different payment processors and content delivery services (like Gumroad). Between this and their drag-and-drop sequences (which fall halfway in between email and automation) — it’s pretty cool. Teetering on the edge, I believe both Gist and ConvertKit are evenly matched in terms of marketing automation. 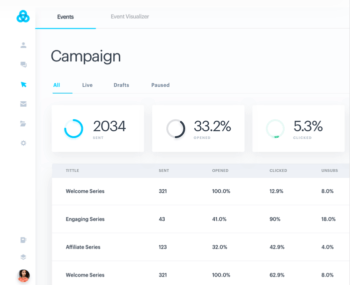 ConvertKit has limited event tracking. It works well with their email and automations to help segment audiences. Gist’s Event Tracking allows users to create a custom snapshot of everything that happens on your site, in your app and/or in emails. Our users can create custom events for just about anything that happens within all of your web properties. ConvertKit’s events get the job done for marketing email sending. Gist allows users the ability to see everything that is happening online. Gist has a form creation tool with 6 preset form types. From there, you can customize colors and, of course, text. Aweber has 4 separate types of forms, but their customization is really cool. You can include images, use their templates and even create landing pages. The templates and styles are heavily geared toward content creators, online courses and other creative types. Of course, you can use their form tool to create forms for just about every other business category, it’s jut how the themes and templates are geared. The look at feel of ConvertKit’s form tool is really nice. What you can create looks good and functions well. They win here. 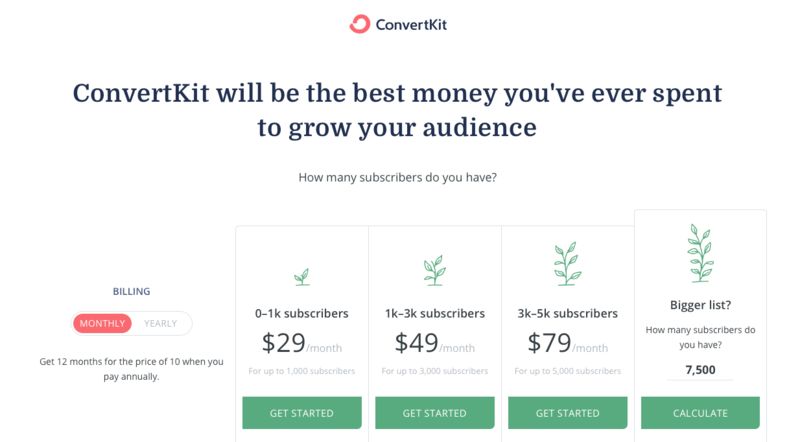 ConvertKit offers a really direct and easy-to-understand pricing structure — almost entirely based on subscriber count. All features are included with every single plan — except for “concierge migration”. This feature seems to be included for those who are moving a list that is more than 5000 subscribers. Gist strives to create a very easy pricing structure as well, but it isn’t based on contact count. There are 3 different plans. Free: Our free plan allows you to use live chat as long as you wish with up to 500 contacts. You can also use our meetings tool. 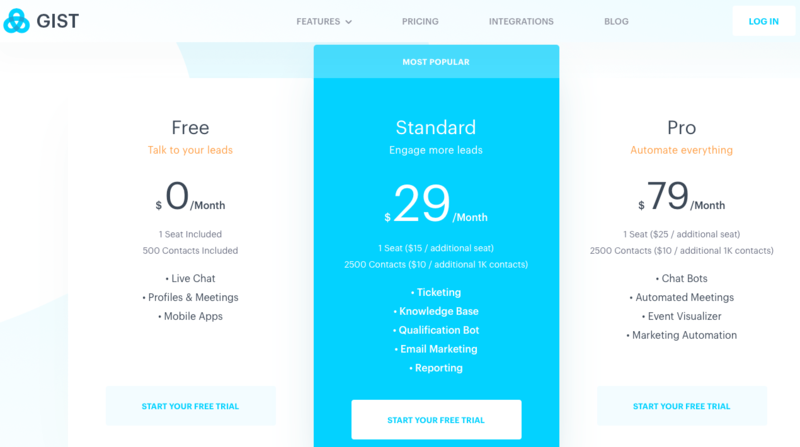 Standard ($29/mo): At this level, the help desk, knowledge base, email marketing (up to 2500 contacts) and limited bot usage. Pro ($79/mo): Every single feature (now and future) is available here. It’s hard to do an “apples to apples” pricing comparison with two different models like this. But Gist wins for two reasons. Straight subscriber comparison: At $29/mo you get 1000 with ConvertKit and 2500 with Gist. Overall number of tools: With that same $29 plan, you get marketing, sales and support tools that aren’t available with ConvertKit. If you sell online courses, ebooks or other digital products; I can absolutely see the appeal of ConvertKit. 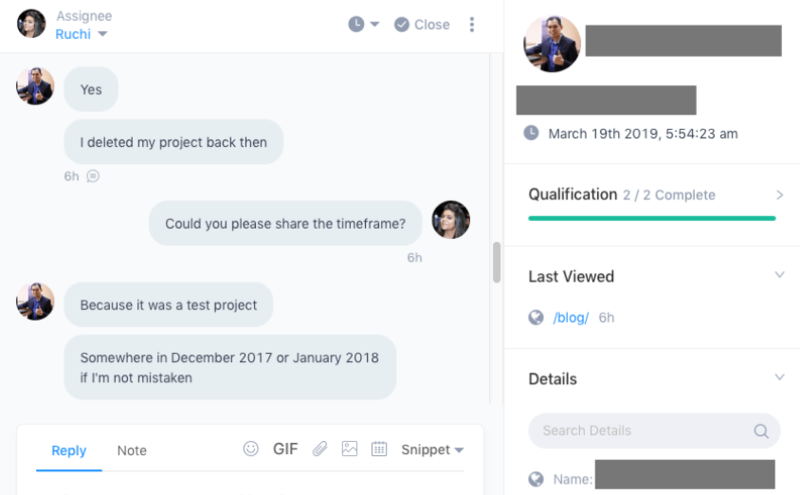 The integrations with tools you already use make it really easy to connect and go to give your students/customers a seamless connection. 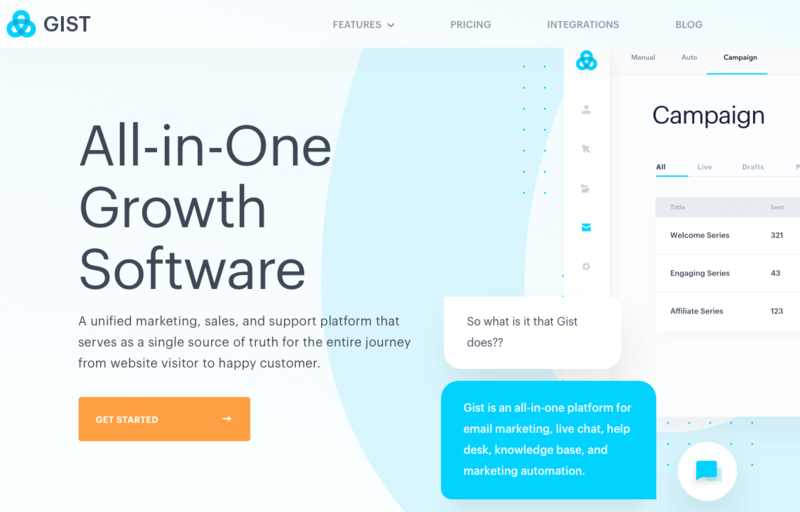 However, if you’re a business wanted to fully automate your marketing, increase your sales and offer support to your customers — Gist is the clear winner. Content creators may take some time to consider ConvertKit, but most businesses and power users will want to take a serious look at Gist. Interested in switching from ConvertKit to Gist? Here’s a guide for migrating specifically from ConvertKit.